Archives of Eaton Bray News for April 2009. This article was published in April 2009. Please see Latest News for more recent information. Eaton Bray Sunday XI (or 10 for this game) constinued their winning streak in 2009 to 2 games by beating old rivals Potten End on a bright sunny day (though only mildly warm). Having consumed a fine tea shortly after my arrival the Bray took the field. Potten End's combination of big hitters and talented youngsters proved a decent match for Bray's varied attack. However, some good outfield catches by Hosking (3 of them) and some good glove work by debutant Paul Darts (2 stumpings) kept the runs in check. Potten End eventually being bowled out off the last ball of the game for 185. The wickets were shared around, Coughtrey, Norris and Roff all 1 each, Peacock and Jones 2 and Flecknel Jnr 3, all point to some decent form leading into the first league games next week. Mention must be made of Jake Barker's 4 overs, looking much more menacing than his old man in 2008, he was unlucky not to get any wickets, though he also had his fair share of tea, so he had a good day!! Lions culminated their season with one of their most illustrious showings to date, outplaying onetime title challengers Oakley for much of the opening half and a chunk of the second. There were some early threats from the visitors which were comfortably dealt with by MoM goalie Dan Kennell but ultimately Oakley found their range and sliced in a scything shot that handed them an early lead. Strong work in midfield by Dominic Ryan, Charlie Nevitt, Mason Ashby and Aarin Johnson kept Lions in the match though, with a Chris McGee shot passing just wide of the left post. In the second half Lions continued to demonstrate their strength in attack, as well as producing classy defensive work courtesy of Ben Roberts, Jake, Adam Bradley, James Pratt and Tom Horner. More forward work had the Rangers suddenly back peddling as Aaron Gauntlett, Will Juster, Will Petherbridge and Alex Poynter all assisted with eye-catching attacking plays, until Sean Woodhouse completed with a searing strike to level the score-line. The visitors struggled to get back on top and eventually managed to net a second, bringing about a narrow and hard fought victory. This was a must win match for the Lions and what a match this was, right from the first kick to the last the Lions were awesome. With Oliver commanding in goal and Thiel, Scott and Hudson in defence the back always looked safe. Again midfield was dominated by Ashby, Ferguson, and Kirkwood while upfront strikers French, Viljoen and Byrne caused all sorts of problems for Kempston who were unable to stop a determined Lions team from scoring five times. The first goal came after 14 minutes after a long throw from Viljoen into the box and French headed home, a great move. Lions' second goal 3 minutes before halftime was a combination of passes starting with Ashby then Viljoen and good finish by French. A minute into the second half from a move started from inside the Lions half the ball moved effortlessly up to French who completed a great hat-trick and the Lions were 3-0 up. The Lions continued to push forward and then with 12 minutes left against the run of play Kempston scored. The Lions replied 5 minutes later with a good individual goal from Viljoen and then in the last minute Viljoen got her second and the Lions finished a superb performance 5-1 winners. This put the Lions into second place in Division 1 and made the Manager and Coaches very proud of every one of them, again. Team: Oliver, Thiel, Scott, Ashby, French, Viljoen, Hudson, Byrne, Ferguson, Kirkwood. The 1st game of the season was played at a sunny Rye Gardens and marked the start of the Peacock regime. He may have been regretting his decision to bat at 19-3 off 14 overs but leading by example and receiving support from Flecknell, a big partnership followed. Flecknell was eventually dismissed for 62 and Peacock retired on 87, with just 3 overs remaining, unselfishly giving others an opportunity to feel bat on ball. Kerins ended the innings with a rare not out as Bray racked up 212 in their 40 overs. Tea then arrived at precisely the same time as Jones. The visitors, Tottenhoe, were soon behind the rate, with the first 10 overs from Ellerton and Pearson going for 4 runs! 2 wickets each for Flecknell and Linney, supported with tight bowling from 7 other bowlers, and some highly unusal diving stops by Jones restricted Totts to 84-8 at the close. Pearson leads the catching cup from all by 2, with Jones leading the race to retain his eating cup, and the groundsman repairing the trenches left by Jones's dives. A good start for the new captain, who will be looking for a 1000 runs this season - although surely much tougher tests are to follow? Lions acquitted themselves well against top flight opponents, conceding a single goal and creating a panoply of textbook football to score twice in the first half and once in the second. Goals came through Joe Rabey (2) and an 0llie West penalty. Myles Frederick was instrumental in establishing the forward momentum of the team throughout, accompanied by Toby McGee. Midfielders Sam Carter and Sam Bramston were energetic in both attacking and defensive roles, while on the back line Joe Thorne and James Glover offered a stubborn and effective resistance to the Borough strikers. Keeper Cameron Burchell produced a handful of fine saves to frustrate the hosts, safeguarding what was to be one of the Lions' most notable performances of the season. The Lions started strongly and went close a few times before Jack Quigley found Dax Roe, who opened the scoring. Playing into a strong wind the defence of Ryan Luff and Findlay Christie played well together and helped Toby Higgs in goal keep another clean sheet. With the wind behind them in the second half the Lions midfield of George Oliver and Jack Nevitt continued to control the game and then four minutes into the second half a throw in from Nevitt to Roe and then a cross into the penalty box from Nevitt gave Oliver the chance to score a great header. Ten minutes later a free kick from Oliver was helped on its way by Nevitt and the Lions were 3-0 up. The Lions played some really good football today and played for the team and not just for themselves. Team: Roe, Quigley, Oliver, Nevitt, Higgs, Luff, Christie. A superb strike from Mason Ashby and an own goal deflected in from a curling Sean Woodhouse cross couldn't help the Lions in a match which slipped away from them after the break. It was 1-1 at half-time but Lions ought to have netted on two or three more occasions, effective forward Will Juster just failing to complete a string of promising runs. Following the break, the home side faced an uphill gradient and an opposing wind, which Sandy were well able to capitalise on. Despite some accomplished keeping by Dan Kennel the visitors seemed to find a surge in momentum and scored six times. But there was excellent defensive work from Ben Roberts, Tom Horner, Aaron Gauntlett, Aarin Johnson and Will Petherbridge, and energetic play by a well linked midfield comprising Dominic Ryan, Chris McGee, Mason Ashby and Charlie Nevitt. This is an update to the previous annual meeting dates and times. Both meetings will now be held on Wednesday 6th May 2009 at The Coffee Tavern. Tthe Annual Parish Council meeting starting at 7.30pm. The agendas for both meetings are now available from the Eaton Bray Parish Council website. More than £800 was raised for Macmillan Cancer Support at an annual quiz night in Eaton Bray. Sixteen teams took part in the Dunstable and District Orbit Club event at Eaton Bray Village Hall. In January, members held an open evening and back in December they helped Dunstable Round Table with its Christmas Float. Orbit club members are friendly people who enjoy raising cash for charity, socialising and having fun. They meet every first and third Tuesday of the month at 8pm at the Dunstablians Rugby Union Football Club in Houghton Regis. To find out more about the club, call 01525 222441. For the latest news from Eaton Bray and beyond, get the Dunstable Gazette every Wednesday and make a daily date with Dunstable Today. The next Parish Council meeting to be held at the Coffee Tavern on Monday 1st June 2009 at 7.30pm. During May, there will be the Annual Parish meeting held on Wednesday 6th May 2009 at 7.00pm, and followed by the Annual Parish Council meeting at 7.30pm. Both of these meetings will be held at The Coffee Tavern. The name of Easter is derived from the name of an Anglo-Saxon goddess of the dawn. In the early days, bonfires were lit on the tops of hills on Easter Eve to celebrate the arrival of spring. Coloured eggs represent the sunlight of springtime. They are believed to have been introduced into Europe during the Crusades, but through the Lenten season of forty days, no eggs were eaten; so they were very much enjoyed on Easter Sunday. Myths from some ancient cultures state that the universe originated from inside an egg. The children (and adults) in our days prefer chocolate eggs; along with the Easter bunny and chicks, they are the symbols of new life and fertility. We have family gatherings; eat meals together. We have special foods, the most popular being the hot cross-buns. A new cycle of life is beginning - nature has received the signal, trees and plants dormant through the winter months have now the energy to break forth. Spring, the season of a million miracles is upon us. We too seem to wake up from a kind of hibernation. We begin to be more mobile, we want to tend the garden, or go for a walk. We want to renew our faith at this most important festival of Easter. The Easter lily is white and the symbol of the Resurrection - the daffodil carries a star at the base of the flower to remind us of the Star of Bethlehem, it carries a trumpet to declare that Christ has risen from the dead; and the long green leaves supporting it represent the Sword of the Spirit. So Spring is here --'O Lord how excellent is thy name in all the earth' Psalm 8:1, the season when every Christian needs to find a place of renewal. Look into our hearts, deepen ant develop ourselves. The cross means many things to many people - to some it is just an ornament to wear around the neck, or attach to a lapel. To those who love the Lord it is a reminder of that dark day of long ago; the agony that was beyond our comprehension, the horror that surrounded the death of Jesus. It is also a reminder that at the resurrection our Lord left the cross and pointed our way to heaven. He gives us quietness, hope, faith, and peace. So that we know as we grow older we will feel the glow of the love of God warming our very souls. “Even to your old age I will be the same: when you are grey haired I will sustain you.” Isaiah 46 : 4. Moffatt. Six weeks into our new committee under the rigorous leadership of Madame Bernadette, and already there's a feeling of excitement about all our plans for the coming season. Membership fees held at last year's levels. That means a whole family can enjoy a year's tennis for around £10 per month. A junior member pays less for a whole week's playing than the cost of a single Daily Mail - so there's no competition really! Three courts - all bookable and accessible by your own personal solid brass key. 8 Teams entered in the League this year - with free tea and sandwiches for away matches! A dedicated Clubhouse with changing rooms, toilets, tables, chairs and famous wonky cupboard. Social playing sessions on Tuesdays and Sundays - everyone made welcome whatever standard. Our own dedicated website - www.ebltc.org.uk - with all the latest news and gossip from the club. A 'Buddy' system for new members - someone to offer support and encouragement. Our own Professional Tennis Coach! An ex-Great Britain player, Nick Boys is available for 1-2-1 or group coaching and specialises in Junior's coaching on Saturday mornings, beginners upwards. No wonder the other South Beds teams quake in their trainers when they see us coming! Saturday 11th April: Round Robin competition at the courts, a fun contest with strange rules that most people master within a couple of years, it's just as much fun to watch as to take part! Saturday 18th April: Quiz night at the village hall. £8 per person, with the usual excellent food thrown in (not literally). More dates to come soon, including our Club Final's Day in September, more Round Robins, and another potential Quiz Night in October. So there you have at least 11 good reasons to call us to find out more about how to both get fit and enhance your social life all at the same time! For any further information about the club, including when we get together for our social tennis sessions up at the School Lane courts, or our various activities, you can visit our website at www.ebltc.org.uk; Alternatively contact Bernadette Hillman, Coach Nick Boys, or if they're all out and I'm not having another argument with the ball machine, me, Andy Cross. Another great team performance, right from the start the Lions were in control. Oliver was back in goal from a recent injury and was back to her confident self and coped well with anything that came her way. In defence Thiel and Scott were never under pressure and pushed forward well to help keep the pressure on Sacred Heart. It was on 12 minutes after a great move from the Lions that French (who was GoM) put the Lions ahead. With Ashby and Hudson dominating midfield it was only a matter of time before The Lions scored again and after some passing again it was French who scored from a really acute angle. Just before half time the Lions were unlucky to concede a scrappy goal and at half time it was 2-1. Three minutes into the second half after a great run French scored again to complete a first class hat trick. The Lions created many more chances with Viljoen and Byrne up front always looking dangerous and only some good goalkeeping by Sacred Heart kept the score down. Another quality display from the Lions. Team: Oliver, Thiel, Scott, Ashby, French, Viljoen, Hudson, Byrne. A really close match between two top teams, with both sides moving the ball well and creating goal scoring opportunities. In goal Higgs pulled off some great saves while in defence Luff and Christie looked solid and coped well with anything that came their way. At half time the score was 0-0. The second half started with Oliver and Nevitt continuing to control midfield it was always going to take something special to split the two teams. Then after 34 minutes Roe slipped a great ball through to Quigley who took his chance well to score an excellent goal. This game showed again that there is very little difference between the top teams and was another entertaining, end to end match. Well done both teams. 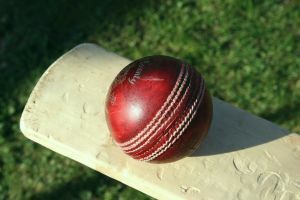 The cricket season starts with a home match versus Edlesborough on Saturday 18 April. The club is again searching for new players. Despite it being a solvent, successful and highly sociable club, it is always looking to increase its membership, especially from those living in the village. The club can accommodate any level of playing ability as it runs three distinct teams. Two elevens play league cricket on Saturdays with the first team reigning champions. On Sundays the club plays friendly-cricket which provides ample opportunities to bat and bowl. So regardless of whether you are young or old, small or big (not too big! ), contact Ian Jones, or if you are brave, attend net practice on a Friday night at the Rye Gardens ground. If you read the Dunstable Gazette you would have see some old GI's looking terribly smug at the Hall's official opening. Well, we do admit to a bit of smugness after all the hard work! We followed that with the Food, Humour and Dance on the 28th of February, a new venture, which was attended by 120 people. May I thank all those who came along that night and all the helpers who helped prepare and do the usual on the night, we raised a considerable amount of money for both the Hall and Tennis Club. We are holding another one of our fabulous Quizzes, in conjunction with Eaton Bray Tennis Club, on April 18th and hope that we can yet again get somewhere near the 160 people who turned up last October. The cost is still only £8 including supper (no surprises as to what it will be) and we hope you can get a team up or even come along by yourselves. We will try to put you with like minded people. As to the hall itself: A working party has sat down and tried to put some order to the next phases of the continued improvements to the hall. This plan will be submitted to the trustees at their next meeting and after that we will let you know what is coming up next. Just a reminder, that two free tickets are available, for the first person to let me know what page the advert for the Quiz is on. Coming up in June is our 6th Beer Festival, Friday 5th & Saturday 6th, more information next time. For tickets or any further information, contact Ross on 221411. Would you like to live life more fully? Come and find out how at St Mary's Eaton Bray at 6 pm on Sunday 26 April 2009. There will be great live music, lots of fun and some refreshments too, as well as a chance to meet new friends. Particularly aimed at young people, but everyone is welcome! For details, please contact Barbara Morton. Starting 7th April 2009, the Mobile Library will visit Eaton Bray on alternate Tuesdays. This service is looked after by Biggleswade Library which can be contacted on 01767 312324. We continue to welcome lots of new faces to our group. This has been a very “messy month!” The children have been painting, icing heart shaped biscuits for Valentine's day, making sticky chocolate krispie cakes, and messing about with cornflour and water! We would therefore recommend that you don't send your children in their best clothes. Due to the success of the group, and requests from parents we have decided to open during the Easter holidays. We would like to clarify the opening time of 1pm, and not 1.30pm as printed in some local newspapers. We have all been enjoying playdough, puzzles, a farm yard, mega blocks, craft activities, junk modelling and chalk boards. In addition, for the girls we have a home corner with buggies, kitchens, dolls and prams, and for the boys we have a lovely big car mat, trucks and lorries, and a workshop. There is an enclosed baby area with soft toys and a reading corner with cushions and mats. The session also includes time for a drink and biscuit, some singing or storytime, and we end the afternoon at 2.45pm. Dates for your diary: on April 8th we will be holding an Easter Raffle, with some great chocolate prizes! Raffle tickets will be on sale from April 1st. We will also be making Easter bonnets and decorating Easter baskets (with chocolates!) On April 22nd we will be sowing cress seeds. On April 29th we will be hosting the annual “Eve Appeal”. This campaign supports the research of the Gynaecological Cancer Research Unit. We are hosting this because a friend of Sarah's named Julia was only 38 when she died and last year Sarah raised £400 at home. If we can raise £1,000 we will be able to have a memory plaque for Julia at the research laboratory. We hope you can help make this possible. We will have some delicious cakes and biscuits for sale, as well as key rings and pin badges. Please come along and support this worthwhile cause. We would like to thank all those parents who have donated their toys, and to Eaton Bray Pre-School for the loan of their parachute! In future we would like to have a “dressing up corner” so if anyone has anything suitable that their children no longer use, please give us a call, (contact details below). If you are a parent or carer and would like to join our friendly group, please come along on a Wednesday afternoon at 1pm, in Eaton Bray Village Hall. Everyone is welcome. We charge £1.50 per adult, £1 per child over 1, and 50p per child under 1. Cheeky Monkeys is run by three volunteer parents, Sarah, Louise and Sue 01525 222387. You are viewing the April 2009 archive.